Carbohydrates are one source of energy the body utilizes to function properly throughout the day and unlike proteins or fats that need breaking down first, carbohydrates can be used immediately and is your body’s preferred source of energy. Carbohydrates in moderation play key roles in maintaining a balanced diet. The main sources of carbohydrates in most diets include grains…breads, rice, pasta, cereals as well as vegetables, fruits, dairy products and other foods containing added sugars such as cookies, beverages and pastries. Most types of fish, poultry and meat do not contain carbs. Low-carbohydrates vegetables are the healthy choice because they provide less calories with high nutrients. On the other hand, starchy veggies tend to be higher in calories and carbohydrates and if carbohydrates are of a concern to you then starchy veggies should be limited. Green leafy vegetables such as broccoli, watercress, Swiss chard, collard green arugula, kale, spinach and dandelion greens are naturally low I calories as well as carbohydrates. According to the USDA National Nutrient Database, in its raw form, spinach provides you with 3.63 grams of carbohydrates per 100-gram serving. Raw broccoli on the other hand has 45 calories and 8 grams of carbohydrates. Green veggies are also loaded with fiber that takes longer to digest and makes you feel fuller for longer periods of time helping to prevent you from eating too many calories. Other great green vegetable choices that are high in nutrition and low in carbohydrates are bok choy, asparagus (provides 27 calories and 5 grams of carbs per cup), artichokes and cucumber. White or Purple Vegetables such as eggplant, radishes, turnips, mushrooms, cauliflower chives, garlic and scallions all fit this category. Raw cauliflower has 25 calories and 5 grams of carbohydrates per 3.5 ounce serving while a 3 ounce serving of raw mushrooms provides 3 grams of carbs and 20 calories. Orange, Yellow and Red Veggies such as raw tomatoes and red onion provide minimal carbohydrates and calories. Pumpkin, bell peppers, and summer squash are all orange/yellow veggies that have small amounts of carbohydrates. For example, a 100 gram serving of raw pumpkin has about 6.5 grams of carbohydrates while a 3.5 ounce serving of raw summer squash provides 4 grams of carbohydrates and 20 calories. 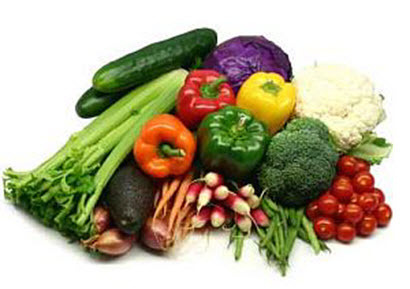 Other low carb vegetables are sprouts, celery, fennel, zucchini, snow peas, rutabaga, radishes and peppers. High carb veggies that need to be limited especially if you are on a weight-loss regime are beets, peas, parsnips, potatoes, sweet potatoes, corn and water chestnuts. You can eat massive amounts of low-carb veggies a day without worrying about going over the 20-50 carb limit… so don’t be shy…fill your plate to satisfaction and include a protein source as well as a fat source with each meal. If you struggle to take off weight it’s time to take my “60 second” test to find out how you fare on the weight loss resistance scale.